This past week, I've been traveling around California, meeting up in the real world with some of the law bloggers who have already hosted Blawg Review. Last night, we partied from after work to past midnight at the offices of the The Williams Lindberg Law Firm in Newport Beach, where my new best friend Craig Williams hosted the Fifth Annual Fall Harvest Open House. Most of the guests were area lawyers, judges, appellate justices, clients, vendors and hangers-on a.k.a. bloggers. Dan Hull was there, and we three stayed late in Craig's sumptuous corner office and talked about law blogging with a Hollywood actress and a lovely young law office administrator -- who knew law blogging could be so captivating when shared with good food, great wine, and interesting people. Earlier in the week, I was a fly on the wall at a law bloggers presentation at Stanford University, and later that evening met up with Professor Ann Althouse and other stars of the blawgosphere at the Bay Area Blawgers get-together organized by Professor Eric Goldman of the Santa Clara University School of Law's High Tech Law Institute, hosted in downtown San Francisco at the offices of Fenwick & West. It was a great gathering of about 75 law bloggers, many of whom knew each other only online. Quite an experience. It was wonderful to meet everyone there, especially our steadfast blawg sherpa and back-up editor of Blawg Review, Colin Samuels, who stands ready to take over as editor if I get disappeared for flying while anonymous. A few of us, including the effervescent Cathy Gellis, went out on the town afterwards to discuss blogging over beers. By the time the bar closed around 1 a.m. it was just me and Kevin O'Keefe, like old war-buddies left to stagger back to our hotels, saying to ourselves, "Isn't it freakin' amazing the people we've made friends with through blogging." Good times. 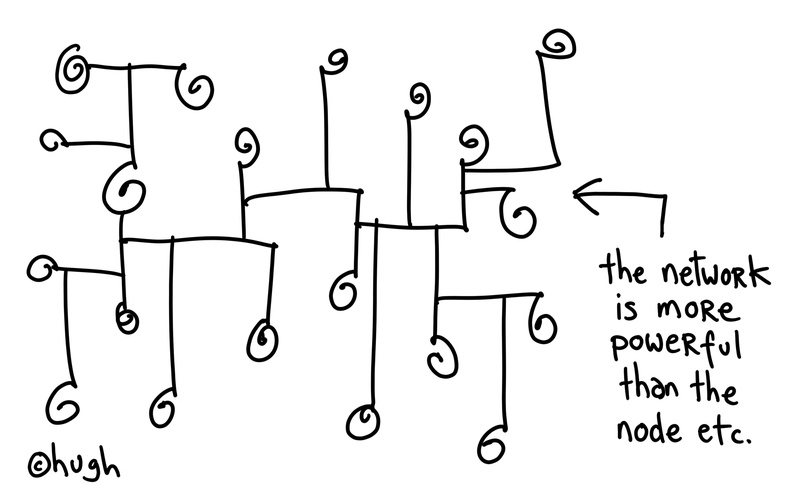 In the end, all this blogger networking reminded me of Hugh MacLeod and his cartoon on the back of a business card that illustrates how the network is more powerful than the node. That would be a good business card for Ed, I thought, pretty well summing up what Blawg Review is all about.